In many ways, modern educational television can be traced to Dr. Carl Sagan's pioneering series Cosmos, originally aired in 1980. Sagan hosts this ambitious series, exploring the nature of the Universe and humanity's place within it over thirteen one-hour episodes. Subjects include the science of astronomy, then-current space exploration efforts, the planets of our Solar System, and the width and breadth of humanity's fascination with the heavens. Sagan's often-parodied speaking style, which can sound a little dreamy-droney at times, belies his considerable passion and intellect. Twenty years later, the strength of his vision has become self-evident, and his theories and remarks remain thought-provoking and well-presented. He doesn't hesitate to go into illustrative scientific detail, but his fascination with time-space mechanics is leavened by a refreshing humanity; he pays as much attention to scientists, philosophers and artists as he does to pulsars, black holes and quantum physics. His approach is pedagogical without becoming pedantic, and sensitive without being sentimental. What Sagan and his team achieve in Cosmos is quite amazing—gorgeous yet scientifically-accurate visuals, Vangelis' oddly undated synthesizer score, historical dramatizations of scientists past, and Sagan's unique brand of verbal techno-eloquence combine to draw in both the emotions and intellect. The occasionally-primitive imagery is achieved using models, paintings and early computer graphics, and music sets the tone for each densely information-packed segment with taste and flair, ranging from classical selections to Pink Floyd's Dark Side of the Moon. The series is subtitled "A Personal Journey," and Sagan unabashedly bares his space geek's soul, reminiscing about his early fascination with the stars and first visit to the library, visiting his former sixth grade classroom to share NASA Voyager photos with the students, and communicating his fascination with the secrets and mysteries of the universe with intelligence and infectious enthusiasm. Cosmos is in many ways the flipside of Sagan's novel Contact, which emphasized emotion in a fictional context, but equally rich and fascinating. I could go on for several more paragraphs about what's great about Cosmos, but words cannot capture the peerless beauty and substance of this remarkable television series. It's entertaining and educational in the best sense of both words, and not to be missed. Image Transfer Review: The DVD release of Cosmos is billed as "digitally remastered, restored and enhanced," but the effort can't disguise the series' vintage videotape origins. Reds are often noisy, colors bleed into each other (especially where special effects compositing is involved) and the image is generally grainy and soft as compared to 35mm film. Superimposed credits exhibit significant dot crawl around the edges, and black level is occasionally lighter than it ought to be. The brief bits of new footage look much sharper, so it's not a DVD mastering issue; I'm sure the 1980 material would have looked much worse absent the digital cleanup efforts. Videotape just doesn't age well, and the quality here is certainly passable—I'd guess Cosmos has never looked better on home video, but don't expect reference-quality visuals. Audio Transfer Review: Cosmos benefits from extensive audio rework, remixing the original monophonic soundtrack into full-blown Dolby Digital 5.1. The enveloping, surprisingly contemporary-sounding score is nicely spread around the soundstage, with Dr. Sagan's narration centered and sound effects generally front-oriented, with some nice rear effects and panning when the material calls for it. An alternative audio track features isolated music and sound effects, providing a significantly different, more contemplative audiovisual experience. Both tracks sound great given the age of the material, generally clear and solid, though frequency and dynamic range are limited and there are a few very brief audio dropouts. The remix is effective and doesn't compromise or overpower the program's substance; one gets the impression that this is how Sagan would have wanted Cosmos to sound had the technology been available at the time. Extras Review: Considering the nature of Cosmos, Cosmos Studios has done a wonderful job providing worthwhile supplements. 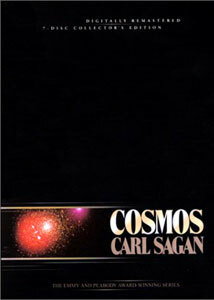 The program is subtitled in seven languages, and the DVD menus are also available in multiple languages, selectable from the initial menu; Website addresses for www.carlsagan.com and www.onecosmos.net are provided on each disc's menu as well. New footage featuring Sagan's colleague and widow Ann Druyan introduces the set, many episodes are followed by Sagan-hosted updates circa 1990, and there's a very useful Science Update subtitle channel, which makes note of scientific developments in the twenty years following Cosmos' production—it's a testament to Sagan's vision and scientific insight that the necessary updates are few and far between. An isolated music-and-effects track rounds out the package, providing a purer audiovisual experience that's surprisingly worthwhile. Given that this is a documentary/educational science series and traditional "extras" don't generally apply, Cosmos Studios has come up with solid, creative and substantial supplements that enhance the set's value. Carl Sagan's Cosmos is a landmark science series, blending scientific fact, theory and a kind of poetry into an educational, inspirational experience. Cosmos Studios' DVD set is nicely mastered given the aging videotape source, and the supplements are appropriate and worthwhile. A very special DVD boxed set indeed. Highly, highly recommended.